The global hit “Downton Abbey” chronicled the lives and loves of Britain’s nobility — and their downstairs staff — in an era of great social change. Now, the show’s creator explores money, desire and secrets in a new novel set in the 19th Century. 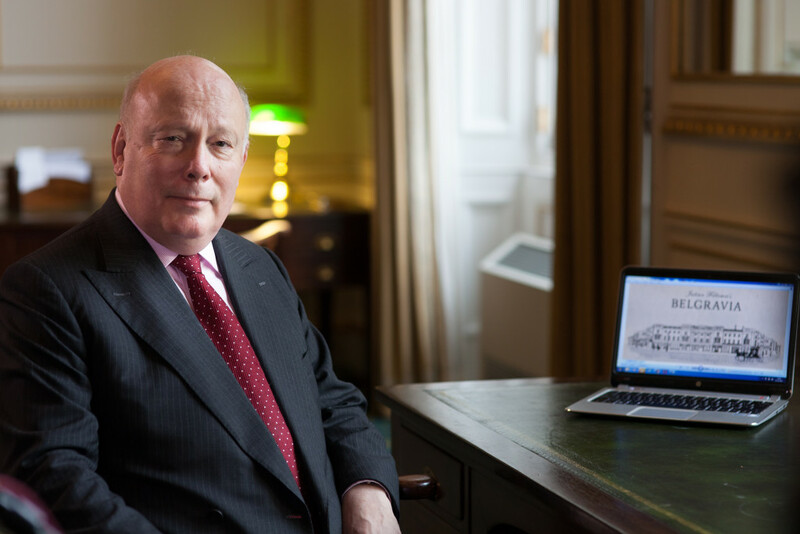 A conversation with Julian Fellowes. Julian Fellowes Writer and creator of "Downton Abbey"; author of "Belgravia"
MS. DIANE REHMThanks for joining us. I'm Diane Rehm. A little over a decade ago, an unknown 52-year-old named Julian Fellowes won an Oscar with a screenplay for "Gosford Park." Since then, Fellowes has been prolific, best known for the smash hit, "Downton Abbey." Fellowes has worked on multiple projects for the big and small screens and published two bestselling novels. This week, he adds a third to his resume. MS. DIANE REHMThe new book is titled "Belgravia." It takes readers back to the 19th century when the British empire was expanding and newly created wealth was shaking the foundations of high society. Julian Fellowes joins us from a BBC studio in Dorchester, England, to talk about "Belgravia" and life post "Downton Abbey." And throughout the hour, we will welcome your calls, questions, 800-433-8850. MS. DIANE REHMSend an email to drshow@wamu.org. Follow us on Facebook or send us a tweet. Well, Julian Fellowes, it's great to see you again. MR. JULIAN FELLOWESIt's very nice for you to ask me. Thank you. FELLOWESI wish you would. It's very flattering. REHMAll right. I shall. "The past, as we have been told so many times, is a foreign country where things are done differently. This may be true. Indeed, it patently is true when it comes to morals or customs, the role of women, aristocratic government and the million other elements of our daily lives. But there are similarities, too, ambition, envy, rage, greed, kindness, selflessness and above all, love have always been as powerful in motivating choices as they are today. REHMThis is a story of people who lived two centuries ago and yet, much of what they desired, much of what they resented and the passions raging in their hearts were only too like the dramas being played out in our own ways in our own time." So you are telling us not only that history is not unlike the present, but that we live throughout history with the same kinds of feelings, emotions and behaviors. FELLOWESYes. I mean, I think this really comes from the fact that when I was a child, when I was growing up, history was still taught in that sort of post-war Marxist theory, that it was all movements, that individuals didn't really matter and personalities didn't matter. I remember having a big argument with my history teacher because I suggested that the foolishness of Louis XVI and the youth of Marie Antoinette had contributed to the French Revolution. Absolute poppycock, he said. It's completely ridiculous. FELLOWESCouldn't matter less who was on the throne at the time. And I don't believe that. I think that personalities govern our politics and our daily lives and, you know, the personality of Mr. Blair, the personality of Mrs. Thatcher, the personality of the Kennedys, the personality of the Bushs, these things have had a tremendous effect on what was happening in our countries. And I like people to understand that history is populated by men and women who are very like they are. REHMAnd, indeed, even today, Prime Minister Blair and his relationship to former President George W. Bush and their effect on history today and what happened with the invasion of Iraq. FELLOWESYeah. I mean, the personal choices that Mr. Blair made are now under fire. And I don't particularly want to join in the chorus against him here, but it is true that he made decisions, like any prime minister or president or king or queen or whatever. They have to make choices and they have to live with those choices and so, to a surprisingly large extent, do we. REHMTell us about the Trenchard family, if that's the correct pronunciation, because they're really one of the central foci of the novel. FELLOWESWell, the point about that is that the Napoleonic Wars that ended in 1815 had taken up Britain's energy and income and might for many years. But the ending left Britain with all those new discoveries and inventions that war always brings and also this expanding empire that, after the victory of Plassey in India towards the end of the 18th century, empire was getting bigger and bigger and bringing with it captive markets. So at that time, we couldn't really overproduce. FELLOWESAnd suddenly, these new inventions, the industrial revolution regathered strength and it produced a lot of new people. And new people came into society and enormous amounts of money. And really, what is symbolic of that is the whole building of Belgravia, which was an extraordinary phenomenon. I mean, normally, bits of a major city grow up and there's the Roman city and then the medieval city and blah, blah, blah, so on. Unless, perhaps, in America, but certainly in Europe. FELLOWESBut here, you have a group of marshy fields that the then Lord Westminster decides or his advisors decide to develop and turn into a city of the rich and it was done and it was done in a very, very short period to accommodate this tidal wave of new money that was coming in and also old money. And the Trenchards really represent that. You have the Brockenhursts on one side of the novel, the (word?) Brockenhurst who -- old money, old family, entrenched in old tradition and you have the Trenchards where he is nothing by birth. FELLOWESThe son of a market trader, but he's managed to be a vittler and he becomes vittler to the Duke of Wellington at the time of Waterloo and, of course, vittlers were crucial to the success of the army and the good ones managed to find supplies. People hardly knew how or why, but they somehow managed to get them. And so Wellington was always very, very keen to have good vittlers and he, then, comes to England at the end of the wars and he teams up with a pair of brothers called Cubit, Thomas Cubitt and William Cubitt, who were developing London, and he makes a fortune and eventually he lives in one of the houses where we sort of pick him up again 'cause we have a gap of 25 years, in one of the houses he built with the Cubitts in Eton Square, which is there to be seen today. FELLOWESYou know, you can look -- in fact, with all these houses, the Brockenhurst House in Belgrave Square, their house in Eton Square, they're all there to be looked at. And he represents what would both disturb and yet embellish and enrich Victorian society, which was this surge of new people coming in. And so that's what you have, the contrast. REHMA surge of new people and he is, as you said, a supplier. He gets everything that his host wants, but he's looked down on. He is not regarded with respect. In fact, he is regarded as someone who is useful and important to keep the lives of the old moneyed rich in comfort. FELLOWESWell, I think that's true to an extent. I mean, I deliberately make Wellington not like that because I don't think the Duke really was like that. He was very much a working soldier, a very practical man. He recognized talent when he saw it and he knew he needed talent so he was much less interested in whether people were well born or in society or any of that stuff. If they had the right stuff and they had what he wanted to get the job done, then he was quite a egalitarian in those ways. FELLOWESI mean, I think it was a tough fight. We quite deliberately also have his wife, Anne Trenchard, and she doesn't care about social climbing. She's not ambitious. It doesn't bother her particularly. She like gardening. She likes her house in the country. She's interested in certain things, but not much in her own social advancement. And by a kind of irony, of course, she is much more successful at social climbing than her husband because she couldn't care less about it. And that immediately relaxes the people around her. REHMAnd you have Lady Brockenhurst on the other hand who is, unlike her husband, looking down on the Trenchards, and most especially on their daughter, whom she sees as someone who might have caught her son's eye and she, Lady Brockenhurst, is determined to put a wedge between the two. But of course, and I won't give away too much, it is Napoleon who does that for her. REHMWe'll take a short break here and when we come back, we'll talk more to Julian Fellowes not only about his new novel, "Belgravia," but also maybe a little about "Downton Abbey." REHMAnd if you've just joined us, we have the joy of having Julian Fellowes on the line with us from a BBC studio in Dorchester, England. We're talking not only about his brand new novel "Belgravia," which I promise you grabs you from the first page, but also about his other experiences and, of course, about "Downton Abbey." There is one question I must put to you. REHMAnd this is a comment saying, I hope that you, Diane, will ask the question the entire world wants answered, who do we have to kidnap to get Julian Fellowes to write and produce new episodes of "Downton Abbey"? FELLOWESNo, I'm afraid there won't be any more television episodes of "Downton Abbey." I mean, I'm still hoping for a film. I think it would be fun and I think it would be interesting to take it on to that slightly different canvas and different kind of shape and I hope that comes off. But, no, the television I think is done. I mean, we achieved what we wanted, which was we got our highest audiences in the last series. And I think that, you know, if you can do that in the sixth year, it's time to quit while you're ahead. REHMI understand that totally. Now, I want to go back to "Belgravia," because you open with a very exciting invitation to the Trenchard family to a party -- a very large ball being given by the Brockenhursts. And in the midst of this grad party comes news that Napoleon is at Waterloo. And what happens next? FELLOWESWell, I wanted -- it's actually -- the party, in fact, is given by the Duchess of Richmond. It's a very famous party. It's a true party that Wellington asked his old friend, the duchess, to give a ball, because he wanted to create the impression that everyone was staying cool and calm and nobody was in a panic. And it was a sort of propaganda exercise really. But what he didn't realize was how close Napoleon was. And so there they were, in the ballroom, and the Prince of Orange's aide came running in and gave them the message that Napoleon was on the march and was nearly at Brussels. And so eventually they all had to rush off. FELLOWESAnd many of the young men, the young officers who were in their dress uniforms would in fact die in them. Because they didn't have time to change back into fighting clothes before they went onto the battlefield. And the first battle was called Quatra Bras, Four Arms (sp? ), and then Waterloo followed two days later. But they never got back to camp, you know, they were fighting the whole time. And so, for me, it's always been a very powerful, romantic, but terrible image of these handsome young men having to rush off the ballroom fall and the girls, their sisters and their fiancés and everyone in tears. FELLOWESAnd everyone, of course, looking perfectly wonderful, but in sobs and weeping. And I don't know, the scene seemed very extraordinary. FELLOWESAnd I wanted a plot that gave me a 25-year gap, for reasons which you will know, the nonreader does not. FELLOWESBut nevertheless, that -- by starting at the Duchess' ball in 1815, I was able to go into early Victorian London in 1841, which is what I wanted to do. FELLOWES...somehow, they just say so much to you about the reality, the humanity of the participants. And I was very moved by it. REHMTell me about your historical consultant, Lindy Woodhead. FELLOWESWell, they were wonderful, actually, the two -- Lindy and Imogen. They would -- I started by writing a pretty tight synopsis, a pretty detailed synopsis. They would take each chapter and they would find the historical events that were happening at that time and the information and everything -- all of that detail, which was wonderful. And then they would put that into the synopsis and then their chapter would come back to me and then I would, you know, rewrite it. I don't want to sound rude, but I would make it my own is a better phrase. FELLOWESAnd then we would go on to the next chapter. And it was a very good partnership and I'm very grateful for it. REHM...approach to create a readable and moving and fun book. FELLOWESYes, that's it. That was the way of it. For me, it worked very well. I hope it works well for the reader. REHMOh, I have the feeling it will. How much, today, do you think those same barriers of class and money hold, when we are told, especially here in the United States, that 1 percent of the population holds so much of the wealth in this country? FELLOWESYes, I -- funnily enough, I think that's a comparatively recent phenomenon, again, this enormously rich, elite class, which is taking us back to sort of Edwardian days. I don't think that was really true in the 1950s and '60s. I mean some people, obviously, much better off than others. But it was all within a kind of similar playing field. FELLOWESWhereas, now, you've got people with literally hundreds and hundreds and hundreds of millions of pounds, which was a concept that would be very hard to grasp really in 1965. It used to be fashionable, as I'm sure you know, in the sort of '60s and '70s to say class was dead and it didn't make any difference and nobody cared about any of that stuff now and so on. Of course it isn't dead. It isn't dead at all. And in fact, the most recent study by the last government here discovered that, you know, birth remains the greatest single determinant on your future, above even education and so on. Birth is still crucially important and indeed far too important. And all it tells us is that the opportunities are not there for people of talent to rise. FELLOWESMind you, having said that, I think America is much better at this stuff than we are. You always have had rule -- I say always, but I mean since the Civil War -- you've always had a society that mixed people who had been there for generations and others who had made it all for themselves. FELLOWESAnd you had this extraordinary period in New York in the 1870s and '80s, when Caroline Astor was setting the rules and deciding who was in and who was out. And she consciously blended the old descendents of the earlier settlers, you know, the Stiversons, and Shermahones (sp?) and people, with all these new arrivals, so the Vanderbilts and the Whitneys and the Goulds (sp?) , and she would meld them together to make an American elite that was quite distinct from the elites of Europe at that time. And actually a much, much better blueprint for the kind of society that answers our needs today, I think. REHMHmm. And tell me about why you released of "Belgravia" beginning this past April via an app that also had these bonus features like photographs and the like? It's almost Dickensonian as you did that. I wonder if you thought of the comparison or modern-day contrast to Dickens' writing in those chapters, that people awaited so, so much on tenterhooks? FELLOWESOh, yes. Yes. I mean, it was quite deliberate. It was Orion, who -- the publishers -- who came to me. And they said, we want to in one way use the 19th century and release it in a 19th century rhythm of a chapter a week. But at the same time, we want to have the 21st century side of it, that there's an app on the Internet and you can meet the people and you can learn more about the episodes mentioned in the text. And all four of the principal houses are real, are based on real houses. And you can go on a virtual tour of those houses and all of this stuff. And, you know, I'd -- I was looking for things to do as "Downton" was coming to an end. And it just seemed kind of wild and rather fun to mix the past and the future in this way and play it out. FELLOWESOf course, I use words like app and things as if I understood what they meant. I mean, naturally I don't. And I need my son to take me on to the correct site on the Internet. But nevertheless, I think most people, certainly under 40, are pretty fluent now with computer speak. FELLOWESAnd, you know, I hope they enjoyed it. REHMThe thing that interests me the most is your wonderful, creative imagination. Have you had that since a very young age? And what do you think inspired it? FELLOWESIt's so hard to answer those things, really. I don't really know the answer, except that I think, as a child, I wasn't a particularly happy child. I mean, my parents were happily married and I had a stable background and a pony and birthday cakes, you know. So I'm not moaning. I mean, I think I was very lucky compared to 99 percent of children on the earth. But nevertheless, I didn't get on particularly with my brothers. I was the youngest brother. And I think that leads you to internalize stuff a lot. And you have a kind of inner life. You have almost a secret alternative life. And I got very interested in history from a very young age. FELLOWESAnd I would read historical biographies and historical novels from when I was really quite young. FELLOWESAnd I was reading sort of biographies of Mary Stewart and that kind of thing. And so I started to sort of live in the past in part. And I think that was a contributory factor. But also I liked narrative. You know, I enjoy narrative. I enjoy reading but I enjoy watching television. I enjoy watching "Mad Men." I enjoy watching "The Good Wife." I enjoy "The West Wing." I like getting involved with fictional characters. I mean, in a way, I think our generation is more geared to television than movies, because I think we like that extended, long relationship with characters who we are fascinated by. But I'm certainly one of those. FELLOWESAnd I think I have always enjoyed film narrative, theater narrative, television narrative, novels. and so, in a way, becoming first an actor and then a screenwriter and a novelist is all sort of part of that picture really. REHM...like "The Lone Ranger," for example, to make sure to go back each week so as not to miss an episode of "The Lone Ranger." REHMAnd you're listening to "The Diane Rehm Show." Julian Fellowes, take us back to the screenwriting of "Gosford Park," and what that Academy Award did for you. Was it a freedom of exercise that somehow came alive? FELLOWESSuccess, if I can use that word without being vain, is a strange thing. And I think never stranger then when it comes quite late and you've got used to a level. I was a reasonably busy actor, a sort of beta-plus. You know, I was in serials on television. I was in a running series called "Monarch of the Glen" for about five years actually. And I'd done plays in the West End and everything. I mean, it wasn't sad. But most people didn't really know who I was, you know? If they recognized me at all, they thought they met me at a house party in Norfolk, you know? FELLOWESAnd then I wrote some children's drama serials at the BBC. And again, they were fun to do. And "Little Lord Fauntleroy" won an Emmy. And it was all great. But it, again, wasn't earth-shattering stuff. And then I was asked if I was interested in writing this film for Robert Altman. And of course I was and of course I was very, very lucky, because he wanted it to be about a subject that I was already interested in, which is that world before the Second World War and so on, and I wrote it. But, you know, I never thought it would get made. FELLOWESBecause it just seemed too big a jump somehow. And Bob, later -- Bob Altman told me that he never thought it would get made until he read the first draft. So we both believed in it simultaneously and then we made the film. He attracted -- his reputation attracted this extraordinary cast. And so here's my first feature film I've ever written being -- well, not ever written, I'd written some that never got made -- but first one getting made, full of the top rack of British actors, to an extraordinary degree. And that was exciting enough in itself. FELLOWES...that America has it. And then I won the National Film Critics. And I didn't win the one in Chicago, but I did win the one at something else. And then I won the distributors award. And then I didn't win a Golden Globe, but I did win the Writers Guild and blah, blah, blah, blah. And that took me towards Oscar night. Even then, it seemed unbelievably surreal. And I just couldn't -- I couldn't think I was going to win. And so I'd worked out this expression, you know, where you have a sort of tolerant smile with a sort of, good choice, you know, and clapping. FELLOWES...that you didn't win. And I was starting to do this. And then, because I hadn't really heard what Gwyneth Paltrow had said. And then my wife Emma lent in, she said, you've won. And I went, whoa, whoa, woola. So if you look at the film, you can see me looking very calm and then go whoa, woola. And I went up on stage and it was all extraordinary. I loved the whole thing. And Gwyneth Paltrow was very, very charming and nice. Because if you're a film star, you go up to the reporters on the top floor alone. But when you're a funny little fat writer, you have to have a film star with you. And she couldn't have been nicer. REHMJulian Fellowes. His newest novel is titled "Belgravia." Short break here. We'll be right back. REHMAnd for those of you who've just joined us, Julian Fellowes is with me. We've been talking about many things, but his brand new novel is titled "Belgravia," and I can assure you, you will be very drawn into this. As I'm sure you know, Julian Fellowes is creator, writer, executive producer of "Downton Abbey." Since the start of "Downton Abbey" through its sixth and final season, Julian Fellowes has been the sole writer for the Emmy Award-winning hit series. He's written 63 hours of television. REHMAnd now a little bit of news for you, Julian Fellowes. We have a Washington Post news alert, a vote by Conservative Party members Thursday has left two finalists Home Affairs Secretary Theresa May and Energy Minister Andrea Leadsom. One of these two women will become the country's leader on September 9, marking only the second time in British history the country has had a female prime minister. What is your reaction? FELLOWESWell, they're both very competent ministers, both very competent women. Obviously the Home Secretary Theresa May has had Cabinet experience and has been a very senior member of the government. Mrs. Leadsom has been a minister but not yet a secretary of state. On the other hand, we've just had this referendum over Brexit, and Mrs. May supported remain in the EU, and Mrs. Leadsom supported Brexit, leaving the EU. And because that is the side that won, the questions the members of the party must now ask themselves is do they want to be led by someone who believed in this cause because now they're going to be responsible for making it work and negotiating and setting up the new treaties and all the rest of it, or is someone like Mrs. May capable with her great experience of simply understanding that this is now the task on hand and getting on with it and using that experience. FELLOWESI think it's a pretty evenly based question, actually. I supported leave, but I certainly think both of them would make a good job of leading the party. So we'll have to see. REHMWill you explain to me why you supported leave? FELLOWESWell, I think if I said how would America feel if judges from Venezuela, Colombia, and Mexico were able to throw out the judgment of an American court over an American citizen if people from Venezuela, Colombia and Mexico were able to tell you who you could trade with and who you could not, and if the laws were being made by an unelected body of people, the commission, who nobody has ever elected, and those laws are handed us to be obeyed as if we were one state in the Austro-Hungarian Empire, you will perhaps understand why despite the fact that banking profits were more easily trousered by remaining within the EU, it wasn't finally the belief of the British people that they should stay in this non-democracy. REHMDo you anticipate the loss of either financial or political power for Britain as a result of Brexit? FELLOWESThe financial issue, I mean obviously I don't want to be too (unintelligible) . We have to go through I imagine what will be some bumpy times. I don't think ultimately we will suffer, no, but I do think there probably are some bumps and grinds that have to be got through. In terms of politics, I think quite the reverse. What a lot of people outside the EU do not seem to understand is that we didn't have any influence within it. In the last 70 issues that we disagreed with the EU, we were defeated 70 times. We had no power there, and now at least as an independent country we will have the power of that country, whatever that may be, as opposed to effectively none. REHMDo you believe that there will be a minimal or substantial loss of trade for Britain as a result of Brexit? FELLOWESNo, I think there will be a readjustment of trade. I think what you have to remember is that, for instance, our former commonwealth partners of Australia, New Zealand, Canada and so on, or even our trading with America, was all circumscribed by the laws governing the EU. It was limited how much we could trade with any of those places. By leaving the EU, we can make our own trade deals with any country on Earth, and that in itself will bring some compensatory elements. FELLOWESBut I think in other ways, you know, the German car manufacturing, of course the car manufacturers don't want to lose the British markets. It's one of their biggest markets. The French wine growers, they don't want to lose the British market. It's one of their major markets. So these things will need to be settled, of course, and negotiated and calmed down and all those other things. But the idea that the car makers of Germany would simply turn their backs on one of their biggest clients just doesn't seem believable. REHMAnd there was truly no way to renegotiate with the EU in such a way to get beyond the disagreements that Britain had with the EU? FELLOWESWell, I think one of the main reasons for voting leave, actually, was that when the prime minister, in perfectly good faith, went to the European leaders to try and negotiate a position that he could then take into the referendum and gave it his all, and they simply wouldn't bend. They made him come back with almost nothing. And if they couldn't bend even when it was 100 percent in their interest to do so and to create some kind of situation where Britain would be more likely to stay there, then I'm afraid that is a comment on the makeup of the EU and why in some sense if it is ever to reform itself, it must be clearly jolted into it. FELLOWESAnd I think if they had thought that differently, if they'd sent David Cameron with some real concessions, then I think there might have been a very different answer to the referendum. REHMAnd one final question on Brexit. What about jobs in the UK? FELLOWESWell, jobs is the main thing, but, you know, clearly it would be very, very serious if we lose a lot of jobs. But it's very difficult because both sides were talking all these facts and figures. At one point the politicians on the remain side were suggesting that every job involved in trading with Europe would be lost. Well, I mean, obviously that was complete nonsense. I'm not saying they were the only ones making nonsensical claims because I think, you know, I'll say again, both sides were making nonsensical claims, but we have to wait and see. REHMAnd on that point, what about Scotland and Ireland? Are you not concerned about what they may be led to do as a result of Brexit? FELLOWESWell of course I'm concerned, and I would be very sorry to lose Scotland particularly. I have slightly mixed feelings about the desirability of a united Ireland, actually. So I'm probably not the one to question on that. But that must be for the Northern Irish, and good luck to them either way. But I would be sorry to see Great Britain broken up. On the other hand, you have to remember that if Scotland does independent and apply to join the EU, they will not have the bargaining position of everything that was given to Britain in order to bring it in. FELLOWESSo they will have to take the euro, they will have to take the Schengen, they will have to take free movement, all of it in order to become a member, which, you know, they may be reluctant to do once they accept quite what it involves. The privileges they have enjoyed in the EU, such as they were, will be gone. And I'm not absolutely convinced that most Scots want that. FELLOWESBut again, you know, I am a democrat. If they are there, if they're Scots, and they want to go, Scotland was an independent country, after all, you know, not just when James I inherited the throne of England, it was independent until the Act of Union under Queen Anne, and it had been its own country before then. So it's no good us pretending it could never be a country on its own. REHMAnd I said one more question, but I have one more, and that is in regard to immigration into Great Britain and what you think Brexit will achieve. FELLOWESWell, immigration is an absolutely central part of our history. We have always been open to immigration. We have always taken either -- you know, whether it's the Huguenots or Jews or whoever it is who have some reason to leave their home country, and we benefitted in every case. They bring different skills and trades and talents, and that's great. And I don't think there's anyone, at least anyone sane, who doesn't agree with that. FELLOWESBut what the issue was was simply the numbers because it's all very well for the artistic community sitting in London and sending their children to private schools and going to private doctors to poo-poo all this and say oh, it's just racist and this and that and the other, but it wasn't because there were many immigrant -- people with immigrant roots who were also voting for Brexit because the numbers had got out of control, and the schools and the hospitals and the this and the this and the this were unable to cope. FELLOWESAnd I don't think I have the right, as someone who lives in a very privileged way, to make fun of people who are objecting to that because they're at the rough end. They're the ones whose salaries are going down and all the rest of it. So I think it doesn't -- I mean, I approve of immigration, I think it's good, and I think we must support it, but I think we have to listen. FELLOWESOne of the great mistakes the politicians have made here over the last 30 years, and I don't specify one party, actually, all of them, is they simply haven't listened to what the electorate was trying to tell them. And that's just the way it is. REHMAll right, and on that note I'm going to open the phones. Let's go first to Joanna in Ann Arbor, Michigan. You're on the air. JOANNAThank you, Diane, it's so nice to talk to you. JOANNAI -- I'm glad that you were talking about Scotland for a little bit because I've wanted to ask Mr. Fellowes about my favorite series that he was involved in, which was "Monarch of the Glen." Before he says anything, I want you to know that I love this series so much that when my husband and I were in Scotland two years ago, we spent quite a bit of time looking for the castle, or the large, castle-like home, in which that series was set. So I'd love to hear Mr. Fellowes talk a little bit about that series. FELLOWESOh, well, I loved doing "Monarch of the Glen." It was a marvelous time to spend -- you know, it was marvelous being able to spend time in Scotland because my mother was Scottish, and so -- and actually her family came from the Black Isle, which is quite near where I was filming, in Inverness. The house we used for Glenbogle was a house called Ardverikie, which is on the banks of Loch Laggan, just between Spean Bridge and Kingussie, I suppose, along -- that's a rather marvelous road, and you drive by the side of the loch, and you look across it, and there you'll see the house, wonderful house, actually. REHMAll right, and here's an email from Julius in Charlottesville, Virginia. What exactly is the relationship between a strict class system and empire-building, such as the one that formed and was maintained by England throughout the 19th century? FELLOWESWell, I think that's a good question, but actually the empire, far from reinforcing a strict class system, rather loosened the class system because, A, the empire produced an enormous amount of opportunities that people took advantage of, and so there was much more money, and there was much more social mobility, but also because the empire needed, they thought, sort of officer-class people to run it, and there weren't nearly enough, they started a lot of public schools and took in the children of businessmen and other, you know, people from the middle classes, and they developed them to run the empire. FELLOWESSo in a way, the expanded the elite with newcomers to get talent in, to get brains in, so that the whole operation would keep going. And in fact what social mobility we have developed really started in those years of running the empire and then, you know, has now obviously gone on. I still think America is our model for social mobility because I think the blend of tradition in America and stable families who run things, and they've been going for ages, but also for opportunities for new people and the blending of these societies very amicably, you know, I think is exactly what we need to emulate. REHMI wonder, Julian Fellowes, how you believe historians might look back on this time of change for Great Britain. I know you've always focused on these historical moments on change in your work. FELLOWESYes, I think this is a very interesting period. I mean, I think we inherited the post-war dreams. You know, there were many dreams that came out of the war in the determination we're never going to have another war, we're never going to do this, we're never going to do that. FELLOWESAnd some of those dreams have been tremendously productive. You know, the national health is real. I mean, you know, where does one stop? There's many, many things that came out of a determination to make the world better after the end of the second world war, and I think that is wholly praiseworthy. FELLOWESBut as things go on, you know, some of them took root and worked, and other -- others didn't. And we're now in a period where things that we thought would go on forever are not going on forever. And so I think this is a big period of adjustment, actually, and quite what the end result will be, I don't know. We'll have to come back in 30 years and find out. REHMAnd maybe you'll begin writing about that even as we speak. You might. FELLOWESYou never know. Julian Fellowes, and his newest book, "Belgravia," it is of course "Downton Abbey" that many of us continue to long for. I know many of you who called in expressed those desires. Julian Fellowes says that will not be. It is over, and now we move on, and we can expect, I think, a new series coming sometime. FELLOWESYes, you can, "The Gilded Age," which I'm sort of now thinking but about to write. It explores the, for me, very, very interesting period in New York after the Civil War, I've touched on it before now in this conversation, when there was, you know, all this money that had come out the tremendously developing times of the Civil War. REHMIndeed, and we'll have to leave it, sadly, at that. REHMWe will look forward to it. Julian Fellowes, what a pleasure to talk with you. FELLOWESOh, you are nice, thank you.